At some point, your male betta will build a bubble nest. Bettas instinctually build bubble nests because bubble nests are how betta fish protect their eggs and offspring. When a male betta feels comfortable and ready to breed, he blows mucus coated air bubbles at the water’s surface, often under a leaf or other structure floating at the water’s surface. A betta’s bubble nest is temperature sensitive and will dissolve if exposed to cold air. So, if you want to help your betta fish preserve his bubble nest, place a floating plant, plastic yogurt lid, or piece of wax paper on the water’s surface. This will provide shelter for the bubble nest and insulate it from cold air. In Walt Maurus’s book, Bettas: A Complete Introduction, he references a university experiment that revealed that male betta fish prefer to create bubble nests under round objects, about the size of a grapefruit, that are yellow in color. Red and green objects were less popular and blue objects were mostly rejected. Once a male betta creates a bubble nest, a female betta may be introduced to his tank. Once together, the male and female betta will perform a mating ritual, in which the male wraps himself around the female betta in an embrace. The female betta will then release eggs. Once the eggs are released, they fall to the bottom of the tank where they are collected by the male betta . He will use his mouth to brings the eggs to his bubble nest and spit the eggs into the bubbles. Male betta fish continue to add bubbles to the nest throughout the spawning ritual. The male will also reinforce the bubble nest as the eggs develop. The eggs remain in the bubble nest until they hatch and the male betta will stand guard over the nest to ward off intruders. Generally, the female betta is removed after the eggs are placed into the bubble nest. This is for her own safety as well as for the safety of the eggs. The male betta will attack and chase the female betta away from the nest, and not without reason (female bettas often eat their own eggs). From a survival perspective, betta fish build bubble nests at the water’s surface because oxygen is readily available and surface temperatures tend to be higher (which keeps the bubbles from bursting). Hatched betta fry, like adult bettas, need access to the water’s surface, and will die if they cannot reach it. If your betta fish creates a bubble nest, it’s generally a sign that your fish is happy and healthy. 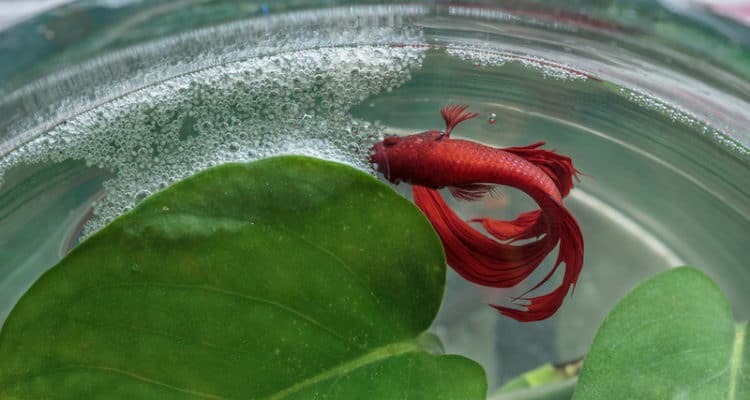 Even if you do not plan to breed your betta fish, watching your betta build a bubble nest can still be a fascinating experience and is a testament to the care he receives. If your betta is blowing bubbles but a nest never forms, check the flow of your filter. If the output of your filter is too strong, your betta may either be too stressed to maintain a nest or the water turbulence is popping all the bubbles. 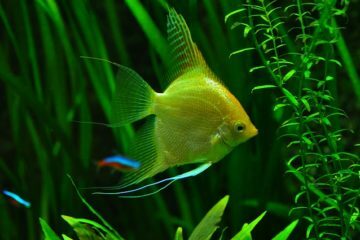 Consider purchasing a more appropriate filter for your betta, like a sponge filter, which will also prevent newly hatched fry from being sucked up. If your betta is listless, laying at the bottom of the tank, or just sluggish and unwilling to make a bubble nest, check for signs of disease and perform regular water changes until you see improvement. Betta fish breeders have noticed that certain events prompt male betta fish to build nests. In the wild, betta fish often live in smaller bodies of water such as rice paddies and muddy ponds. Because these bodies of water are in danger of drying out, a male betta’s instinct likely drives him to build a bubble nest after a heavy rainfall. In captivity, this instinct to build a bubble nest after a storm may be triggered by a water change. Competition may also stimulate bubble nest building. If a female betta fish is choosing between two males, the male betta that has a bubble nest completed may be favored over the male who does not have a bubble nest. Research also suggests that betta fish nest building is influenced by seasonal changes and changes in temperature. Betta fish have been observed building bubble nests in temperatures of 64 degrees to 84 degrees F but the ideal temperature for encouraging bubble nest building appears to hover around 79 to 80 degrees F.
If you take a dozen bettas and study their bubble nests and breeding behavior, you will notice that different male bettas build nests differently. While some male betta fish cover the surface of a tank with bubbles, others build small, compact bubble nests. Some betta fish build thick nests, stacking bubbles on bubbles, while others build barely noticeable bubble nests. Male betta fish behavior also varies, with one male building a bubble nest at the sight of a female, while another male may wait till the female is ready to breed. 1) The male and female betta evaluate each other and each fish begins to transform. The male betta’s colors become more vibrant and the female displays vertical stripes. 2) The betta pair will swim side by side in a kind of dance. Often the male betta will become more aggressive at this time and lunge at the female, nipping at her. 3) The female betta fish may dodge the male’s lunges and retreat into a hiding place. The male will then build his bubble nest, or add to his existing bubble nest. 4) As the bubble nest builds, the male betta will approach the female less aggressively, spreading his fins and gills and swimming in an “S” pattern. 5) After displaying to the female, the male will swim back to his bubble nest. The female betta may follow him at this point, but many females hesitate for a time before finally approaching the bubble nest. 6) When she is ready to spawn, the female will swim toward the male, head down, fins clamped to her side. 7) The bettas will then circle each other until the female is turned upside down and the male drapes himself over her body (this process is called an embrace). Swimming activity ceases briefly. 8) If the embrace was successful, the female will begin dropping eggs. The male then releases the female and rushes to collect the eggs from the bottom of the tank while the female betta floats to the surface in a trance. 9) The female betta will then “wakeup” and assist the male with gathering the eggs into the bubble nest (or she will eat the eggs). 10) With the spawning process completed, the male will often chase the female away from the bubble nest. At this point, it’s a good idea to remove her from the tank. The male betta takes charge of his offspring and will care for his fry until they become juvenile betta fish. Eggs typically hatch within 24 to 28 hours. After hatching, the fry hang out, tail pointed downward, in the bubble nest. Soon the fry begin exploring the nest area and the male will vigilantly collect any fry that stray to far from the bubble nest. Betta fish bubble nests are a fascinating aspect of keeping a betta. Whether you decide to breed your betta or not, bubble nest building is a sign that your betta is healthy and comfortable in his environment. Maurus, Walt. 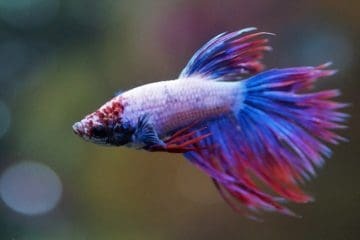 Bettas: A Complete Guide . T.F.H. Publications, 2003. Brammah, Martin. The Betta Bible: The Art and Science of Keeping Bettas . Self Published, 2015.